Today’s AM fix was USD 1,284.00, EUR 930.91 and GBP 771.26 per ounce. Yesterday’s AM fix was USD 1,286.50, EUR 932.45 and GBP 772.67 per ounce. Gold fell $2.80 or 0.22% yesterday to $1,280.50/oz. Silver rose $0.02 or 0.1% yesterday to $19.81/oz. 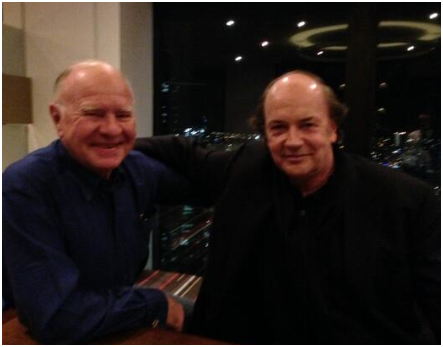 This Friday, April 4th at 0900 BST, Dr Marc Faber will give insights into his strategies for protecting and growing wealth in 2014 and beyond. Gold climbed in London, its first rise in 3 days. It is believed that the seven week low will lead to renewed physical buying in China. Gold bullion of 99.99% purity for delivery in Shanghai traded at a premium to the London price earlier today, Bloomberg data showed. China was last year’s largest gold buyer and is already on course to surpass last years record demand. 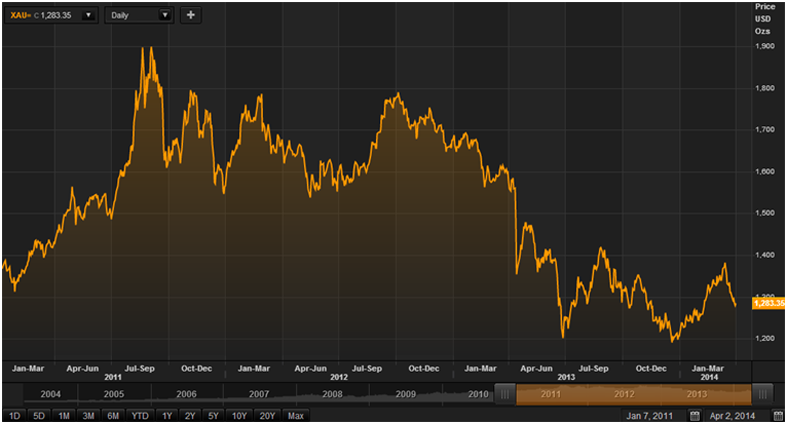 Gold fell 3.2% in March due in large part to speculation that the Fed may reduce their massive monetary stimulus and return to more orthodox monetary policies. However, gold was 6.8% higher in the first quarter as many investors viewed the 28% sell off in 2013 as a buying opportunity. Geopolitical risk and the Ukraine crisis led to safe haven demand and may be leading to renewed central bank diversification into gold including from Russia itself. After a long first day of presentations at the WWD conference in Melbourne, the international keynote speakers, Marc Faber, Jim Rickards, Richard Duncan and John Robb got up on the stage to answer questions on topics ranging from Bitcoin, to China’s economy to gold. Faber said his concern about Bitcoin was how reliant it is on the internet and electricity networks functioning properly, something that can’t be taken for granted in the age of digital warfare. Technology risk is something we have warned of for sometime. It shows the importance of not having all your savings and wealth in digital currencies in banks, in digital currencies like bitcoin and emerging crypto currencies or indeed in digital gold formats whereby you are very dependent on and exposed to websites, servers and technology in general. WWD: Money, War and Survival in the Digital Age heard from Faber that gold, unlike digital assets, is a physical asset and that it had performed superbly until September 2011. Faber said that gold has been in a correction since then, which isn’t unusual in a money printing environment. On gold at today’s prices, Faber said that “the fact is that gold down is a present from God and I wish it would go lower so I could buy more,” he said. The big proviso Faber added was that he had to physically own coins and bars. He also warned that people would be ‘mad’ to own any asset, including gold, in the U.S. Previously, Faber has said that he favors owning gold in fully allocated gold accounts in Singapore and Switzerland. This Friday only, April 4th, Dr Marc Faber will give insights into his strategies for protecting and growing wealth in 2014 and beyond. Dr Faber’s webinar takes place this Friday, April 4th, 2014, at 0900 BST (0900 British Standard Time or London and UK time). Register to attend the event or to receive a recording of the webinar.